Below are the research proposal forms and timeline for submitting projects to the Endowment. The Endowment’s fiscal year begins on July 1 and runs through June 30, therefore funding for projects begins in July of next fiscal year. AFE research solves scientific challenges posed by disease, pests, and other environmental issues. This research benefits not only growers but every segment of the industry down to the consumer. The call for proposals is announced in February and all applications are due no later than June 1. Applications must strictly follow the guidelines or they will be returned. The first review and notification process will be completed by October 1st. 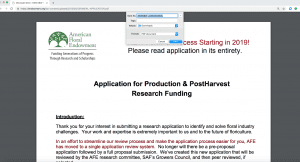 Special Note: AFE requires that all funds for research and educational grants be used for the funded project. No funds may be used to cover indirect or overhead costs. (Note: It is possible to type most of your answers directly into this form, with the exception of the supplemental information required, which can be submitted as a separate PDF file. If you are unable to type out your answers directly into the form, download the file and save it before completing it [see image below]). Applications that are preliminarily approved for funding will be peer-reviewed. All researchers will be notified by October 1 of the status of their application. If selected, an independent scientific peer review* will be carried out. Final selection of research applications to be funded will be determined no later than January 15. This allows for the recruitment of graduate students to take place in the spring. Researchers will be notified in early February by email and postal mail. Funding for research projects is administered in two phases. One half of annual funding is distributed in July/August and the other half in January. The Continuing Projects Funding Request has been incorporated into the Progress Report Application and is due by June 1. Continuing project funding is subject to review by the Board of Trustees and is contingent on the availability of funds. Final funding will be announced after the Endowment’s Annual Meeting in August. All documents must follow guidelines or they will be returned. The primary research priorities are listed below. They are focused on all floricultural crops – bedding plants, fresh cut flowers, fresh cut greens, flowering potted plants, and foliage plants. *If you are a researcher interested in becoming a peer reviewer, please contact AFE. We are always seeking new reviewers in specialty fields.